April 10, 2009 | Comments (0) | by T.R. The Cubs graciously assisted the Brewers in opening Miller Park for the first game of 2009. Expect ticket sales in Milwaukee to nosedive when Chicago leaves town. Cory Provus now backs up Bob Uecker in the Milwaukee radio booth? Traitor. WGN Radio goes through third string booth guys like Spinal Tap goes through drummers. Bradley finally broke out with his first hit of the season, a home run to put the Cubs on the board in the fourth. Man this kid knows how to work a count. He may only be hitting .083 at this early stage, but what a stud! Koyie Hill followed with a two-run shot in the sixth, making it 3-2 Cubs. Harden looked fairly good today, though he had to work through a couple jams. It was nice to see Lou pull him going into the bottom of the seventh after 96 pitches. During the commercial break I was dreading the possibility of Harden going back out to the mound. Ten K's, one earned run, and only three hits allowed for his efforts. 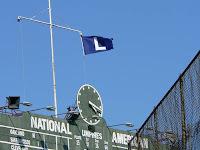 Unfortunately, the Cub bullpen gave a heart attack inducing performance. Heilman entered the game after Harden, giving up a walk. He was then lifted for Neal Cotts (!) who promptly plunked Craig Counsell and was removed. I'm going out on a limb and saying that we need another lefty in the 'pen. Marmol came in, gave up a walk, but coaxed two more outs. Somehow they escaped without any damage. What a hassle. Piniella proceeded to blow through the bullpen in the eighth. I guess everyone had to get their work in. He brought Marshall out to start the inning, but yanked him after a walk to Fielder. Then Vizcaino nailed two outs, leaving Fielder at second base, when Kevin Gregg came in. He struck out Bill Hall to end the inning, and would come on in the ninth to attempt the four-out save. He would fail. All that meticulous bullpen shuffling for naught.